Having perfectly straight teeth is probably something you have craved for a while, yet you are unsure of what to do, or you have been too busy. Many people think treating crooked teeth entails wearing traditional metal braces to shift their teeth into the proper position. This would be right decades ago, but recent advances in cosmetic dentistry have made it possible to straighten teeth with less conspicuous methods. Below, we focus on three common ways to treat crooked teeth to achieve a straighter and better smile. Invisible braces are simple. Through medical imaging, the dentist makes a custom wire and bracket setup that fits your mouth perfectly. Also called lingual braces, these braces are invisible because they fit on the back of the teeth, which does not exactly hide their presence but makes them less conspicuous. Not only do invisible braces have a better appearance, but they also provide better results. Each wire and bracket device is created specifically for each tooth and therefore gives patients faster restoration times: usually between six to twelve months depending on the condition. It is normal for invisible braces to feel uncomfortable at first. You may experience tongue irritation or a lisp. They are also costlier than other restoration options. Nevertheless, the aesthetic advantage makes them preferable and deserving of the extra price. 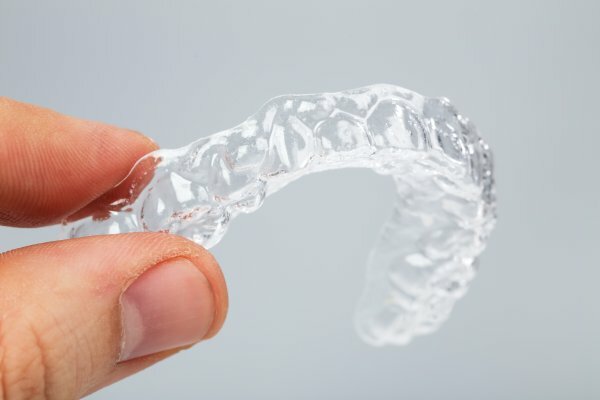 If you want to avoid the trouble of brackets and wires, you can opt for another teeth-straightening option: Invisalign clear aligners. This aligner is somewhat cheaper than invisible braces and less visible. In fact, Invisalign can stay perfectly hidden from the naked eye, and its trays can be detached for eating, brushing or flossing. The only drawback to this option is that it is not practical for severely crooked teeth. You would need a more powerful option for large gaps and alignment issues. Porcelain veneers offer you a quick, effective solution for treating crooked teeth. The cosmetic treatment can hide multiple flaws at once. They are thin sheets of ceramics with a similar appearance to a fingernail and cover the front side of the teeth for a total smile makeover. Aside from overlapping teeth, porcelain veneers are also useful for discolorations and physical impairments of the tooth, including chips and cracks. Straightening crooked teeth is much more comfortable and convenient than it used to be. You do not have to deal with metal braces for extended periods anymore. Consult your dentist to discuss the best dental procedure for your condition and achieve the smile you have always wanted. Request an appointment in our Bellevue office here: https://www.implantdentalbellevue.com.